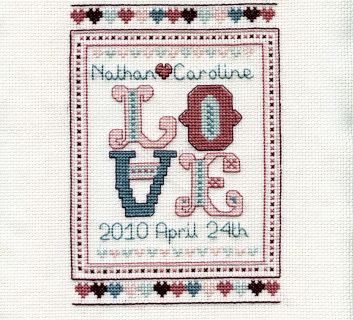 'Love' Wedding and Anniversary This is a contemporary sampler, designed in a pretty antique pastel colours. Personalize for a perfect memento for any romantic occasion. The kit comes with 14 Count, Zwiegart, cotton Aida and DMC cotton embroidery thread. 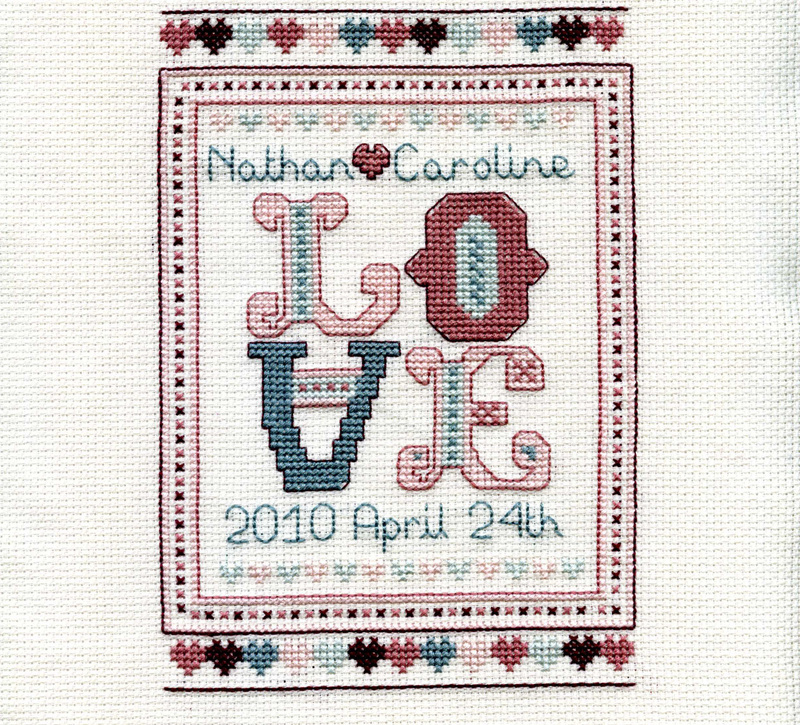 Create your very own family heirloom with this pretty, personalised wedding & anniversary Cross-stitch ‘Love’ sampler. Commemorate a special date for a special couple with a gift they will enjoy for years to come. This contemporary sampler is designed in a pretty antique pastel colour scheme, perfect for any romantic occasion. Your kit comes with everything you need to stitch your ‘Love’ sampler and is hand packaged with a pretty bow so that the kit makes a thoughtful gift for any crafter. A clear & easy to read pattern, designed by myself. An alphabet chart and guide to help you to personalize your sampler. A piece of Cream, 14 count, cotton Zweigart Aida to work on (14 holes per inch). Once completed the stitch area is 12cmx17cm and is pictured here in a 6 x 8” frame.